When architecture students in Freedom by Design took on the task to create a handicap-accessible ramp at the Westminster Presbyterian Church, they decided to expand on the concept. 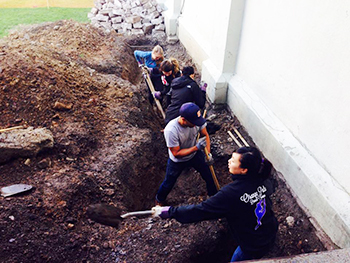 Members of the School of Architecture student organization are constructing the ADA-compliant ramp, along with a shelter from snow and icicles, outdoor storage and community spaces, including seating and a barbecue area. 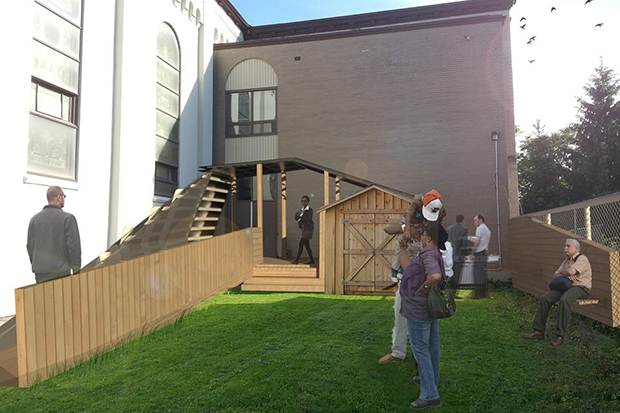 The project, named “Into the Fold,” started last fall with groundbreaking for the ramp at the church on the North Side of Syracuse and will continue this spring to put in the pre-fabricated elements. The project is a way to both work with the community and test their classroom skills. Project manager Stephen Muir ’17 was familiar with the notion to expect the unexpected. Freedom by Design, part of the American Institute of Architecture Students, designs and constructs projects that assist people with disabilities. Its members also raise money to fund the project. This latest project was first developed by a cohort of Freedom by Design students who had also been involved in a prior project, the Play Perch at Jowonio School. The students visited the site and worked closely with their faculty advisor, Associate Professor Larry Bowne, who helped them elevate their design. The students also consulted closely with the Rev. Patricia Simmons and the church’s treasurer, Bob Conine, on the needs of the church. Members of Freedom by Design get down and dirty working on the site of Westminster Presbyterian Church’s future handicap-accessible ramp. The Freedom by Design students also raised about $10,000 for the project, through fundraisers, grants, a crowdfunding website and a grant from the Fast Forward competition. The competition, which was part of Chancellor Kent Syverud’s inauguration last spring, provided funding to several student projects. When they broke ground last fall, an initial problem was the amount of backfill, such as rocks, wood and steel that had been buried in the ground from previous projects. “We had to do a lot of manual labor to accommodate that,” Muir says. But they’ll be back at the site this spring and expect to have the majority of the project done by April. At this time, parts of the installation—made of lumber, polycarbonate and galvanized steel—are being pre-fabricated in the workshop at the School of Architecture. As the process continues, Muir has taken away from the experience the understanding that the plans you have on paper may not be the way things out. He’s also grateful to have been part of the Freedom by Design team. “I wanted to be part of the organization because it’s great to help the community and it’s something I’d love doing in the future,” he says. Freedom by Design is looking for more people who are interested in working on the project. For more information, contact Chen at rchen27@syr.edu or Muir at smmuir@syr.edu.